Winnie’s picture before come back from leave. A Man this drum Jimmy Dorsey. Winnie 5.30 to Newark. Only. 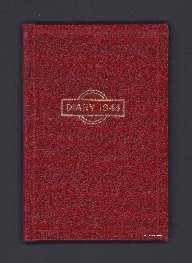 H Madgett, “Hedley Madgett diary 1943,” IBCC Digital Archive, accessed April 23, 2019, https://ibccdigitalarchive.lincoln.ac.uk/omeka/collections/document/11270.